That’s right – it’s a busy time of year, so we’re giving you 2 weeks to join our Inspiration challenge with the Paper Craft Crew! Isn’t this a beautiful inspiration challenge? The warmth of the browns and gold, along with the shine and natural accents. So much to work with! I can’t wait to see what you design. I went with the natural elements of the inspiration, along with the shiny ornaments. To do this, I just had to pull out one of my retired favourites , Ornamental Pine. I’ve kept this set ever since it first came out, which was probably about 3 years ago. On a panel of Whisper White cardstock, stamp the pine branch image in the upper right corner, in Garden Green ink. Add a few more bits of pine needles along the bottom. 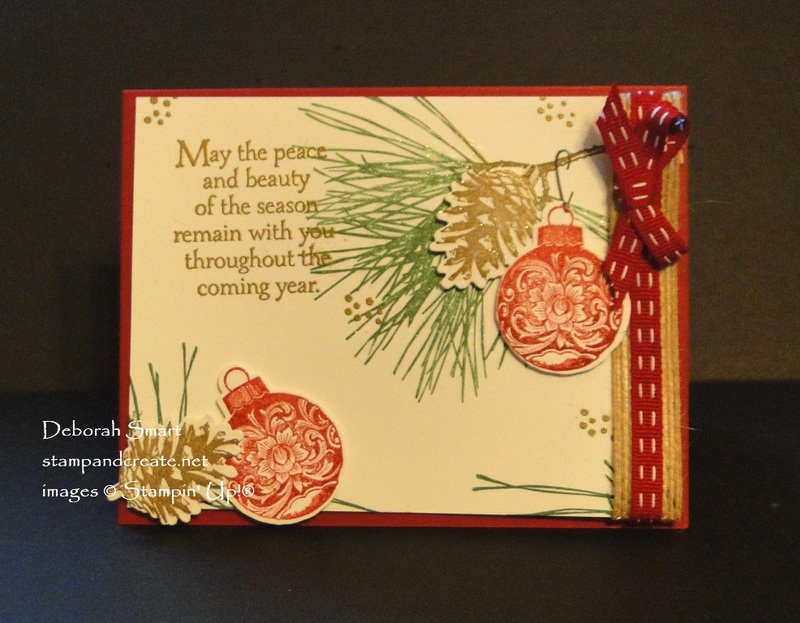 Next, stamp the small spots image from the Timeless Textures stamp set in Versamark ink randomly around the pines. Cover with Gold Embossing Powder, and set with the Heat Tool. 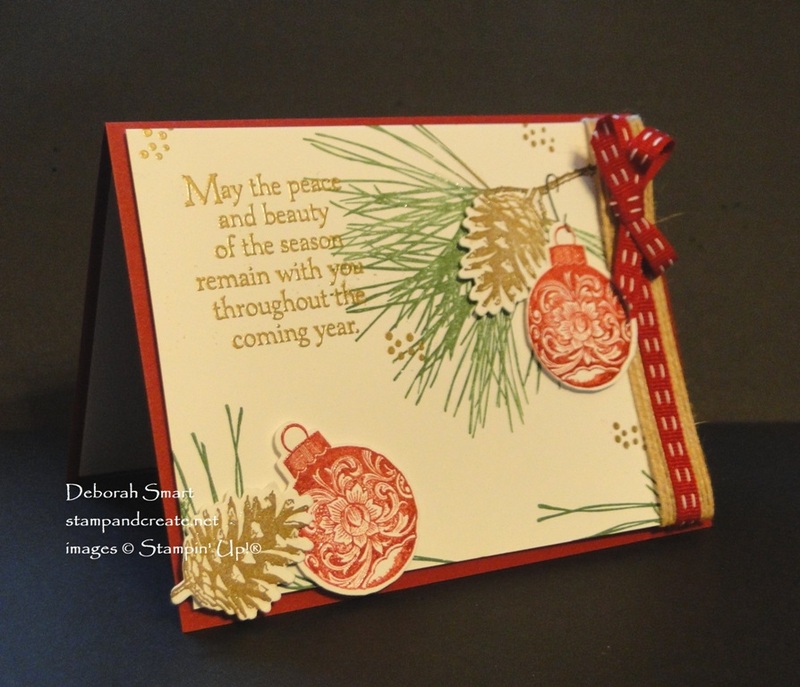 On separate scraps of Whisper White, stamp 2 pine cones in Soft Suede ink, and 2 ornaments. To emboss the ornaments, first ink up with Versamark ink, then immediately with Cherry Cobbler ink. Stamp onto the cardstock, then cover with Clear Embossing Powder. Now set with the Heat Tool. Use your Paper Snips to cut out the 2 ornaments and pine cones. Holding one of the ornaments in place under the branch, stamp the hook image in Memento Black ink, so that the hook catches the top of the stamped ornament loop. Wrap first a length of Burlap Ribbon around the right end of the panel; hold it in place with Tear & Tape on the back. Next, wrap a length of the 1/4″ Double-Stitched Ribbon in Cherry Cobbler on top of that. Finish by tying a bow with the same ribbon, and attach it with Mini Glue Dots. As a final finishing touch, I covered the pine, pinecones and ornaments with Wink of Stella. I think you can see it better, in the top picture. You’ve got 2 weeks to join, so there’s plenty of time between now and after Christmas to spend some time stamping! For more inspiration, check out the Paper Craft Crew challenge page. You’ll see what the rest of the Design Team have created, and that’s where you’ll find the link for the challenge. Previous Previous post: NEW ITEMS ADDED TO CLEARANCE RACK! Next Next post: New Stamp Set Sneak Peek!